Whatever your budget or preference you’ll find a bed to give you a good night’s sleep. 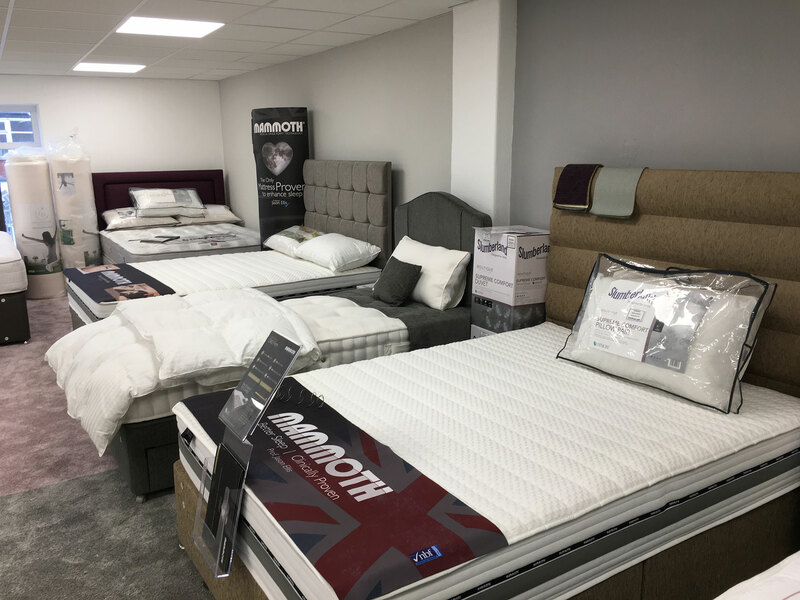 Visit our bed showroom with ranges displayed both downstairs and upstairs. Take a look and try out the range of divan beds and mattresses. Pick the accessories to go with it from a range of pillows, mattress protectors, duvets and headboards. We supply a range of beds from quality, leading brand name suppliers, at prices to suit all pockets. Sleepeezee UK have held a Royal Warrant for the last 30 years. They manufacture a wide range of beds to suit all tastes and budgets. They also produce the Dreamer bed, used in Travelodge Hotels. The secret to Mammoth beds is the medical grade foam which is ideal for pressure relieving and bad backs. They work in partnership with the Chartered Society of Physiotherapy. Luxurious Harrison beds are pocket sprung and use 100% natural upholstery fillings. It’s a premium quality range for a great night’s sleep. A full range of different sized beds are available – single mattress, double mattress, king size mattress and twin mattress. 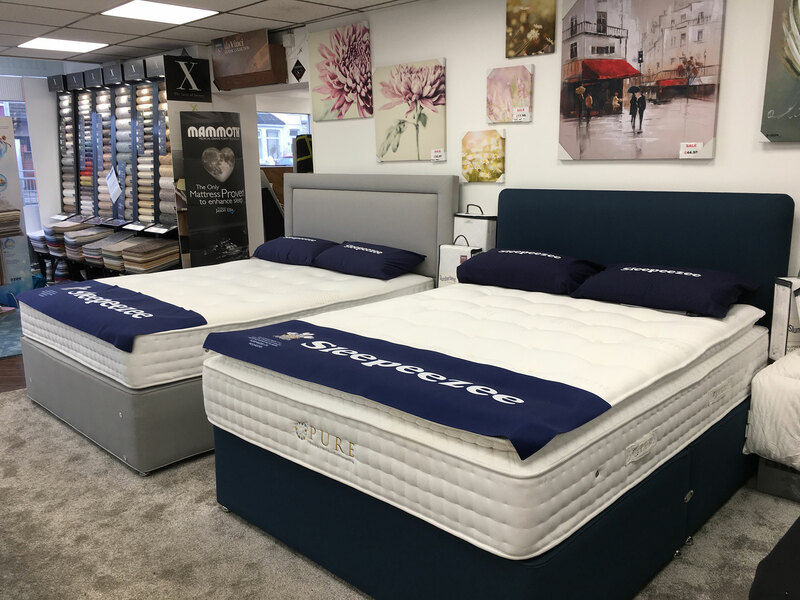 There’s also a wide range of mattress types stocked at Finsbury House – including sprung beds, gel beds, medical grade foam beds and memory foam beds. They can be made from a wide range of materials including wool and cashmere or latex and gel. Sprung mattresses can be pocket sprung or coil sprung, with anything between 800 and 5000 springs. Some you need to turn, others are designed to be non-turn, while some mattresses just need to be rotated. What kind of base would you like your bed to have? You might like the traditional look of a mattress on a bedframe – or if a bedstead isn’t your thing you can choose from different types of divan base which include different drawer and storage options. Don’t forget to check out the adjustable beds too. Picking the right one when you buy a new bed or a new mattress can feel like a difficult decision to make. After all, you’ve probably been sleeping on your current one for some years and it feels like an old friend and a new one will feel strange at first anyway. Now you can take some of the guesswork out of the decision with the help of the Sleepeezee BodyScan. Make sure that you pick the right type of bed, and the right level of softness to suit your own body, with the help of technology. 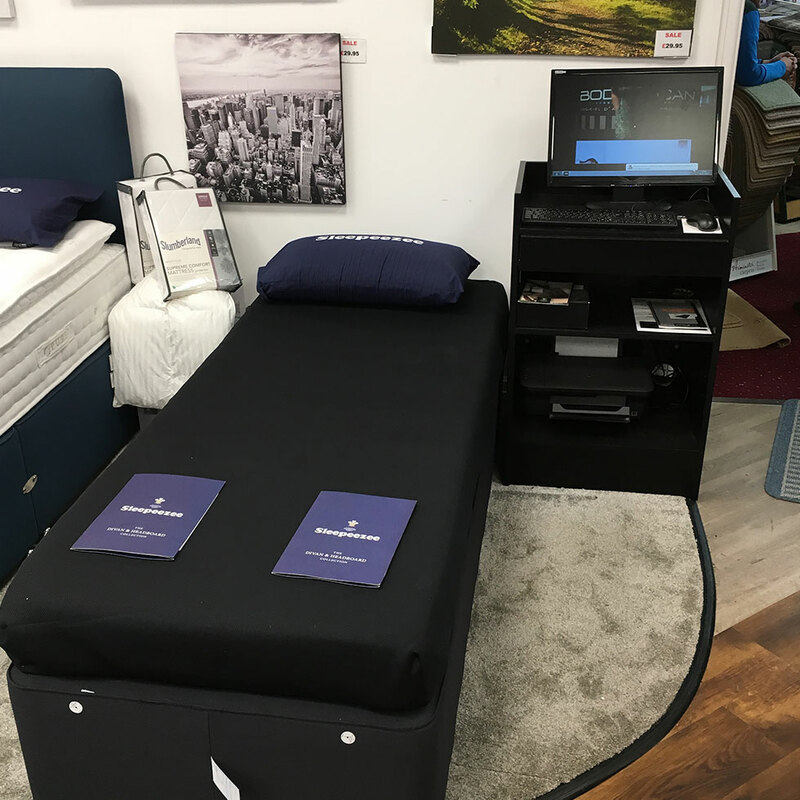 Lie on the BodyScan and it will assess the distribution of pressure from your body and recommend which would be the best three best beds from the Sleepeezee Pure collection to specifically suit you. If you’re investing in a new bed, there’s a good chance that it’s time to invest in new pillows too. While a bed or mattress will last anything around 7-10 years, you’ll need new pillows much more frequently than that, and it’s recommended that you buy new ones about every two years. Remember than an old, unwashed pillow can contain up to 10% of its weight in skin scale, dead and living dust mites and their droppings! 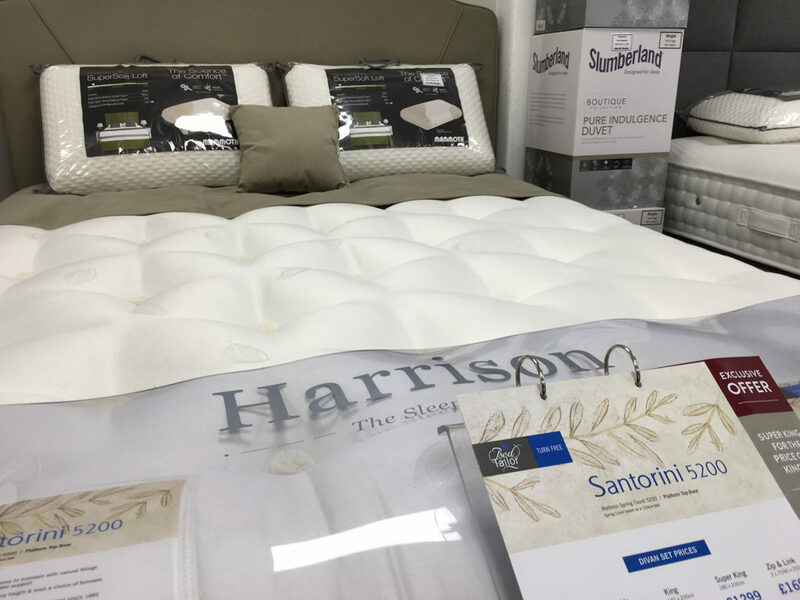 At Finsbury House Carpets and Beds you can select your new pillows, a mattress protector to keep your investment clean and a new duvet and feel safe in the knowledge that you’ll get a great night’s sleep. 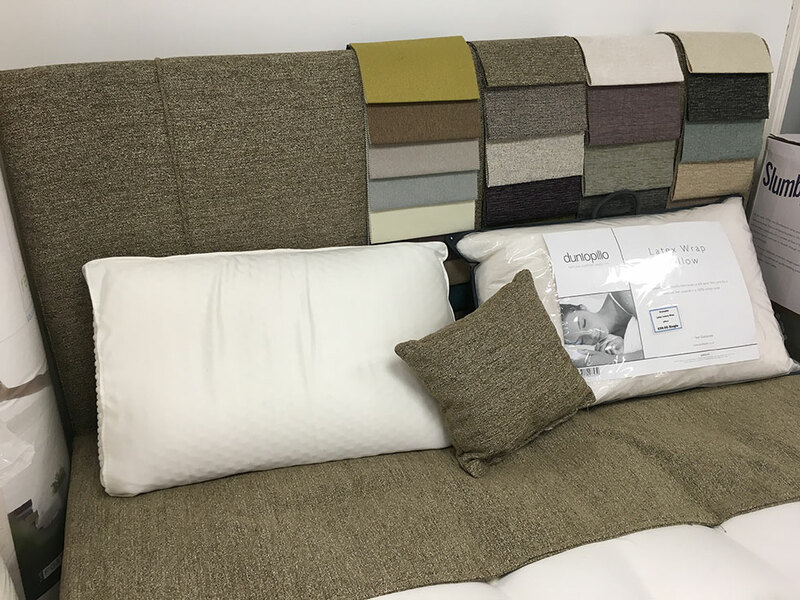 When you’ve sorted out your own comfort it’s time to turn your attention to the interior decoration in your bedroom and you can finish off the look with a new headboard from our range. Don’t forget to check out the huge range of carpets while you’re in store and go for a complete bedroom transformation! A variety of factors can affect how long your bed will last, but generally it’s recommended that you think about buying a new one after seven years. 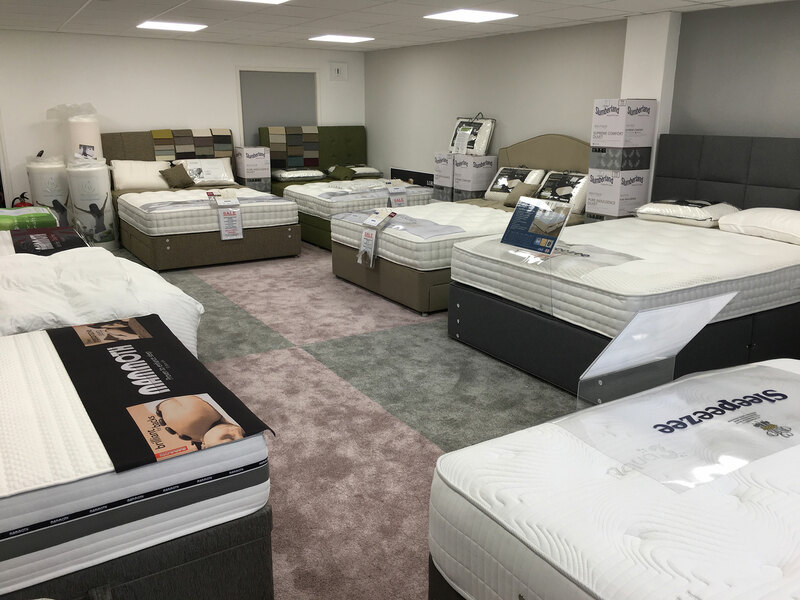 If all the choice is baffling, there are always assistants on hand at Finsbury House Carpets and Beds to talk you through the different options and make sure you pick the type of bad and mattress that will give you a good night’s sleep. For example, did you know that while memory foam mattress fillings compress and mould to the heat of your body, medical grade mattress fillings don’t and so offer a more consistent and cooler surface to sleep on. When you buy your bed or mattress from Finsbury House you can be assured that we’ll deliver it to your house as part of the price. A bed – whether it’s a King Size complete with a divan or a single mattress – is a heavy, bulky item and many people just aren’t able to cope with manhandling it – so our delivery men can sort out the assembly and positioning in your bedroom (Charges may apply) – and even take the packing plastics away when they leave. Choose Finsbury House Carpets and Beds for leading products and standards of customer service. So whether you’re looking for a complete new divan bed, or a mattress, or accessories in Blackpool or the surrounding area, get in touch today on 01253 762065. Visit our showroom on Ansdell Road in Blackpool and have a look at our wide range of products which are available for you to view, try and buy from us.